AMMAN — Jordanian social media users are responding to recent confrontations between young Palestinians and Israeli occupation forces and settlers by voicing their support for participants in what some of them called “The Third Intifada”. Users circulated news, photos and videos of Palestinian men and women of all ages resisting Israeli aggression. Another user (@BordaneLina) highlighted resistance to occupation as a shared issue among Palestinians, regardless of religion. “When we are defending our homeland, religions do not separate us, [the] homeland [is] for all and we are all for our homeland,” she wrote. 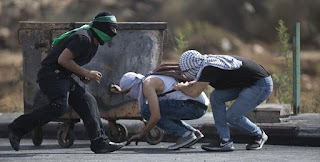 Meanwhile, several users commented on the outfits of Palestinians involved in the resistance efforts, which were mainly denim trousers and T-shirts, suggesting that the younger generation remained strong in defending their rights despite some “Westernised” habits. The widespread participation of women in the uprisings reminded Rimi Afaneh, a Facebook user, of the role of iconic Palestinian women in previous revolutions, such as Dalal Mughrabi. “Dalal Mughrabi did not die,” she wrote. Several users criticised the lack of coverage of the issue in international media outlets, especially the failure of these outlets to highlight video recorded incidents of Israeli forces killing “in cold blood” unarmed Palestinians who were not posing security threats. Jordan has condemned the recurrent Israeli crimes against Palestinian civilians and violations of the sanctity of Islamic and Christian holy sites in Jerusalem, as well as the killing of Palestinians at the hands of the Israeli occupation forces in the West Bank and Gaza. The first Palestinian Intifada (uprising) erupted in 1987 and continued until the early 1990s, while the second one erupted in 2000 and continued until 2005.